Thanks to Tricosérum (Serum plant), which combines Saw Palmetto extract and hydrolyzed Wheat Protein Complex phytoactive (based on corn and soybean sprouts, Vitamins A, B3, B7, E, F, H, Pro - Vitamin Ginseng extract and B5) hair Loss Treatment Serum is the best and most effective option to combat hair loss, regulate, densify and repair the hair.Ideal for both men and women this intense formula is ideal in combatting male pattern baldness or sudden hair thinning . Increases hair regeneration after a period of 3 to 6 months. 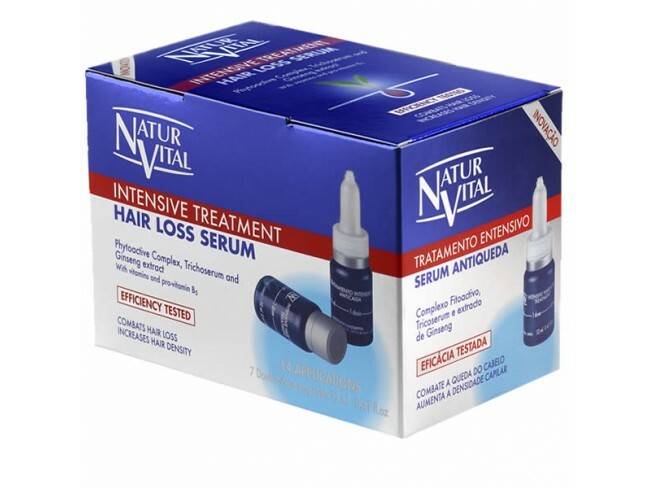 Hair Loss Effectiveness tested over 83%. Increases capillary density, nourishes and moisturizes at the root. Serenoa repens, is a shrub native to the southwestern United States. Its leaves are arranged in a fan shape, are rigid and bright green. The extract from the fruit has an inhibitory effect of the enzyme 5 alpha - reductase, this enzyme affects testosterone, which leads to excessive hair loss. It has moisturizing, softening and restructuring, as well as in cosmetics is also used to treat hair loss. Climbing plant that blooms in early to mid summer. Its leaves are opposite and palmately divided into 3 or 5 lobes. Lupilina Contains essential oil, tannins, asparagine, fatty acids, adenine and choline. It has sedative, relaxing and bacteriostatic. In cosmetics is used for treatment of dandruff and hair loss, toning and strengthening it in its growth phase. It is a herbaceous plant of the Araliaceae family. Its root contains ginsenosides, saponosides triterpene, polysaccharides, proteins, vitamins and minerals. Used in cosmetics for its anti-free radical and anti-aging properties. It is also used in shampoos and hairloss lotions and works by stimulating and stregthing hair growth.